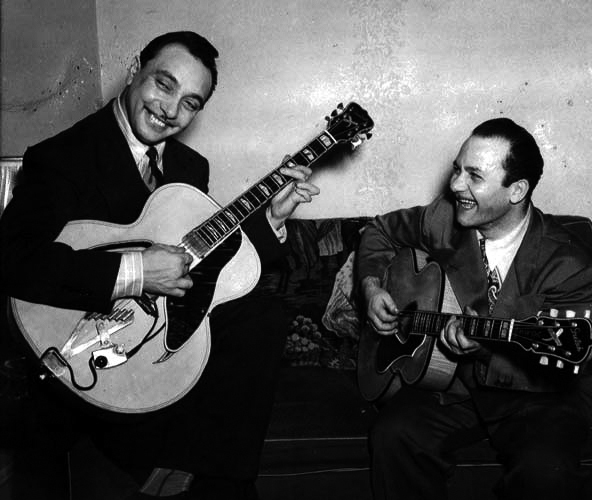 Back in the old days of this blog I mentioned in THIS post on Django Reinhardt that I’d found some cool pics and information about Django’s time in New York City in 1946. This period coincided with Django leaving his acoustic-based sound and moving to electric guitar, which thanks to Charlie Christian, had become a viable tool guitarists could use in performance and recording. This was a time of transition for Django and while, in my opinion, he weathered it brilliantly, there are many people, Stephane Grappelli (his partner for many years) and Les Paul included, who believe he never really adapted to the electric format and should’ve stuck with what he had. However, Bebop swept the post-war world and all of the swing bands were no longer the HOT thing and for a guitar pioneer of Django’s stature it couldn’t have been easy to be thought of as “old hat.” When the chance to tour America with Duke Ellington (a chance that was offered to his whole band) Django jumped at it. Alone. He arrived in the USA thinking that the country would roll out the red carpet for him and luthiers and guitar makers would be waiting to hand him the best of what they had. He couldn’t have been more wrong. By the time Django returned to Europe many illusions of his international stature were shattered, but I think that says more about unrealistic expectations than anything else. Had he brought his band they might’ve done very well. What did happen was he met some very interesting players and returned to France an electric, bebop-influenced guitarist. There would only be a few more sessions where he would play acoustic before ditching it altogether in favor of an electrified sound. In the end, I think he got a really good electric thing going. It must have been a thrill for him to have VOLUME and AMPLIFICATION at his disposal — two qualities every guitar player in the West takes completely for granted in this day and age. One fella that Django met in the United States was Harry Volpe. Harry was almost as much a guitar pioneer as Django and was a well-known figure at the time as a performer and teacher. He had his own music store/studio and teaching academy and in time would count Joe Pass, Johnny Smith and Sal Salvador as some of his students. He was the first guitar player to be on the staff at Radio City Music Hall. I couldn’t find any of his own performances to link to but there are some good players do interpretations HERE, HERE, and HERE. If you have heard any of Django’s solo guitar material it’s easy to see similarities between his and Harry’s styles. Obviously they got along very well musically and personally, as the pictures from their jam sessions show. Aside from the fact that it’s cool to have all the information available on Django’s only trip to the United States, the pictures and info give a nice little snapshot into that period of New York City, which is very interesting to me. 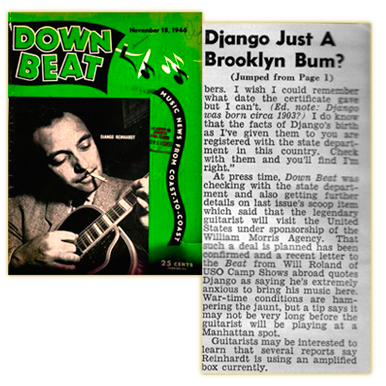 A funny thing, for some reason, Downbeat, the jazz magazine of the day, seemed to think Django was a Brooklyn Bum, meaning he was born there! Not really sure where they got that idea. Harry Volpe’s studio was in Jackson Heights, Queens and this was the scene of a memorable all night jam session he had with Django in 1946. I believe it would have been in November of that year as the Ellington band (with Django) appeared at the New York Aquarium. This is where some of the most famous pictures of Django with a smoke and a guitar were taken. 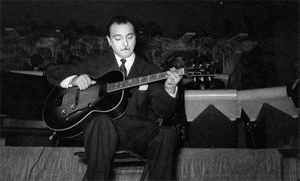 After the Ellington tour Django stayed in New York until he eventually returned to France in February of 1947. A semi-famous silent home movie shows him getting ready to leave and once again, Harry is on the scene. Supposedly there were other movies of them eating spaghetti and jamming, but I don’t think those two films have ever surfaced. Another thing that was interesting to me, especially as a Gretsch player, was that Harry Volpe endorsed Gretsch guitars, which probably meant a lot to Gretsch at the time because they were trying to compete with Gibson and Epiphone for the arch-top market. While they didn’t succeed both Django and Harry are playing Gretsch guitars at these jam sessions, which amuses me to no end. You don’t see many people trying to play jazz on a Gretsch these days or ever…Chet Atkins might come to mind. Brian Setzer doing his rockabilly/swing thing maybe. George Harrison. 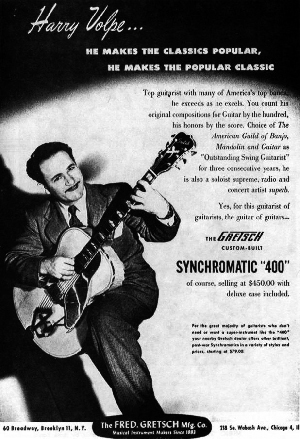 But in the picture below Django is playing of the Harry Volpe-endorsed Gretsch Synchromatic 400 Guitar (the same one from the above ad?) while Harry is playing a Gretsch Special. I thought that the Gretsch would have a nice amplified Django sound and I’ve already tried to show that HERE. In the fall I play some on the Gretsch through my Schertler David amp because that sound is just TOO COOL. I didn’t buy the guitar specifically for that purpose, it was a matter of using what I had, which was the same in Django’s case. He played electric before he came to America, a fact that was established by the good folks at the Hotclub UK site HERE. This is one of only a few movies of Django playing and it is on YouTube. But don’t get too excited — the clip is only 10 seconds long. 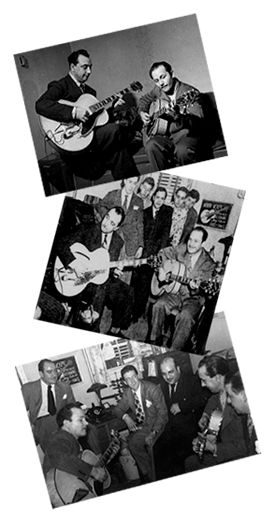 During his tour of the US with Ellington Django used a Gibson ES-300. This picture was taken at the Pla Mor Ballroom in either Kansas City or Lincoln Nebraska (there were two ballrooms with that name). He was notorious for not having a Gearhead mentality for equipment and obviously was capable of playing pretty much anything he was handed. He did remark however, once he was back in France, that nothing beat his long-used and trusty Selmer, which he quickly outfitted with the new Stimer pickup system and used (as far as anyone can tell) for all of his recorded electric work until his death in 1953. 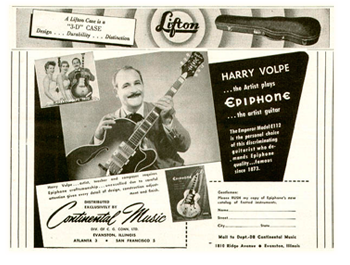 Harry went on to endorse Epiphone in the 1950s and I have to repeat something I mentioned in my first pass at this topic. Was he the first guy with an endorsement deal? (No! As was kindly pointed out by MAC below in the comments, a fella by the name of Nick Lucas had a deal with Gibson in the mid-20s) Nowadays having a guitar named in your honor is as common as a cheese sandwich, but given Harry’s reputation and the fact that he was also teaching students and running a store makes me wonder if he was the first. Who else would qualify? Django and Harry were able to get their sound on many different guitars, electric or acoustic, because they had really great technique and understood how important great hand work is to playing guitar. There are so many things one can do, a fact I just highlighted in the Fingerpicking Good post, with or without a pick that affects how the instrument will sound. Gypsy-Jazz picking is very forceful and powerful and I’m sure Django had to adapt a bit in order to play some of those creamy-smooth modern jazz lines one can find on his recordings from the 1950s. He could also make the instrument bark if the situation required, but ballads are usually the measure of how well a player translates emotion into pure sound. (One of my best achievements last year was a version of Nuages played on my Gretsch through the Schertler amp at a gig. 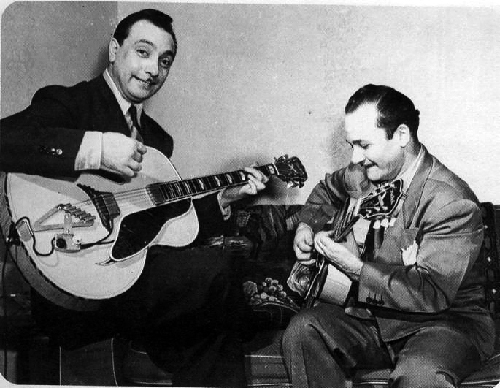 It was BRAVO) Django and Harry Volpe both excelled at this type of playing, which is why I’m sure they enjoyed the short time they were able to play together. Although Django didn’t do as well as he expected on that US tour, he must have had some fun times because pictures seem to demonstrate that he found a few Americans to be kindred spirits and he was a person who loved life. There was another go at this country in the works when he died and had he been able to come over in the mid-50s and blow his electric brand of music, I believe he would’ve enjoyed a much better reception. Harry Volpe lived for over 40 years after Django passed away and enjoyed some great successes, including the music production of The Time of the Cuckoo at the Empire Theater on Broadway, teaching at the Frost Conservatory and performances with his trio on coast-to-coast broadcasts of early television pioneer Arthur Godfrey’s show. He isn’t a name guy even though he lived into the 1990s, but he was definitely an important guy in the development of guitar, as an instructor to some of the best guitar players ever, and as the creator of some very beautiful music. Thanks to the folks at the Paul Vernon Chester website for sharing their materials. There is a lot more info there!